You'll be set for storage space with beautiful drawer dresser and mirror in your home. 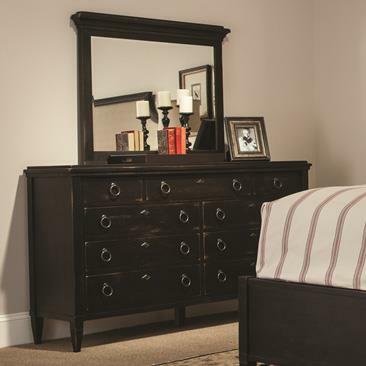 The dresser carries a beautiful dark brown finish with gorgeous distressing and solid maple wood. In addition, the nine drawers are wonderful for keeping sweaters, jeans, blankets, towels, books and undergarments. Plus, the two bottom drawers are cedar lined. Meanwhile, the matching vertical mirror also comes with beveled glass. There will be so much to like with this drawer dresser and mirror in your home. The Springville Drawer Dresser w/ Vertical Mirror by Durham at Stoney Creek Furniture in the Toronto, Hamilton, Vaughan, Stoney Creek, Ontario area. Product availability may vary. Contact us for the most current availability on this product.